One of my biggest objectives in recipe development is simplicity. I often joke if a recipe’s ingredients can’t be counted on one hand, it’s too complicated. 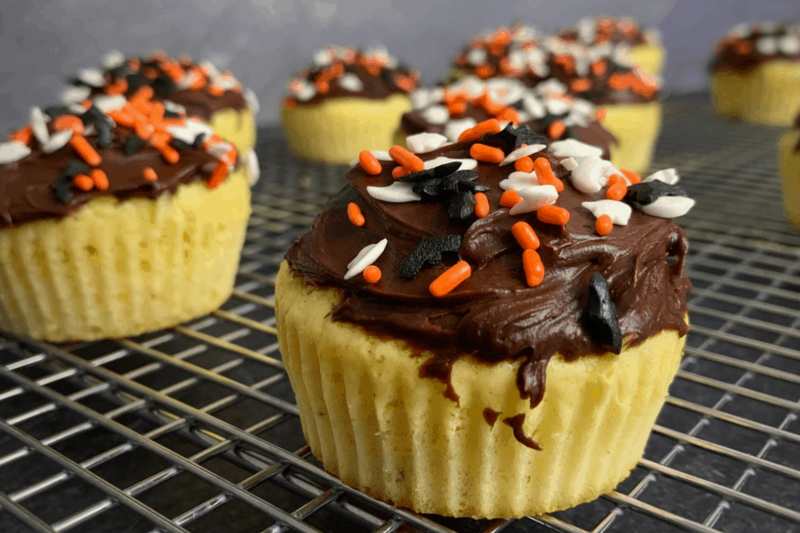 That’s hyperbole, of course, but these simple protein cupcakes definitely pass that test. 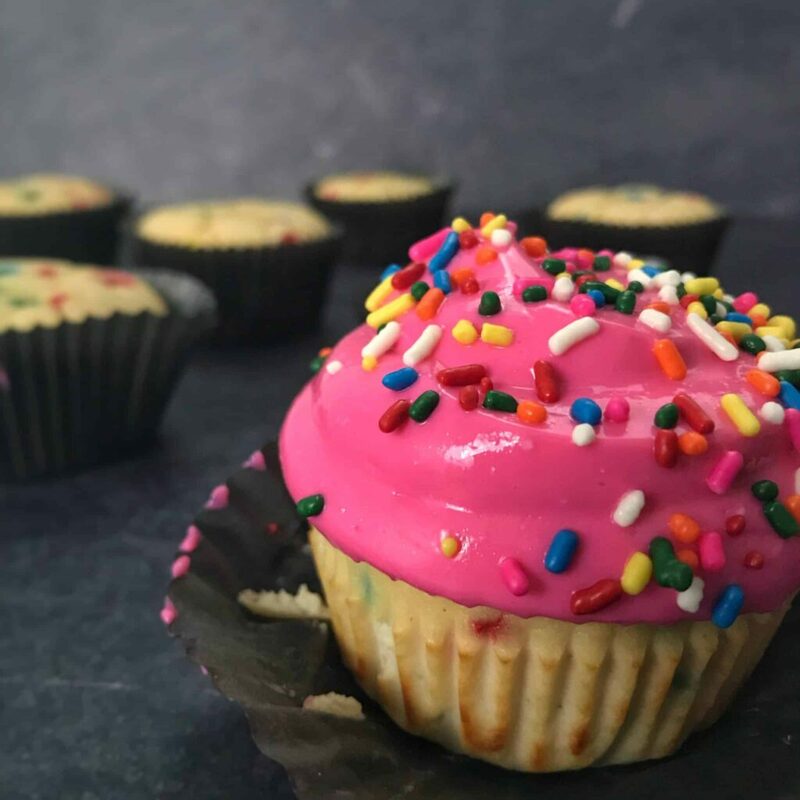 Straight out of the box, this cupcakes recipe has 99 calories, 6 grams of protein, 14 grams of carbs, and 4 grams of fat per protein cupcake. 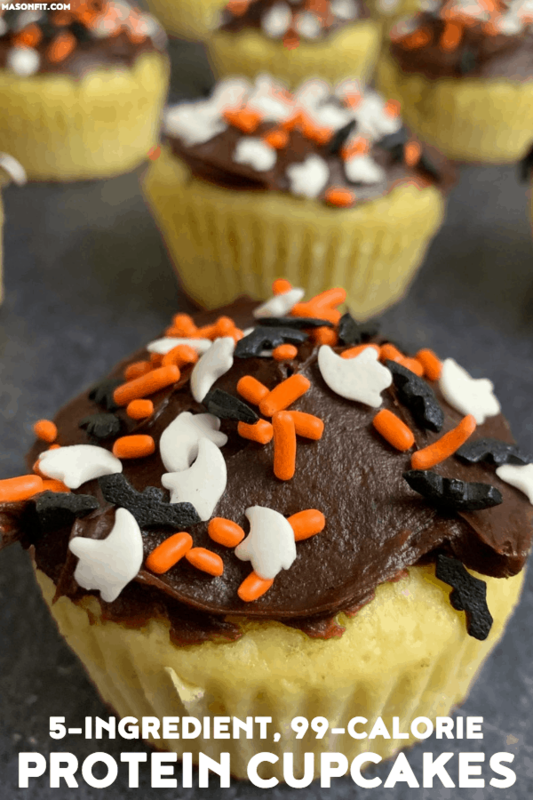 I’ve included lots of tweaks and modifications for certain ingredients and ways to make these protein cupcakes even more macro friendly. Rest assured those tweaks are fairly simple as well, with one option being a 2-ingredient protein frosting. Two of five ingredients on the list are pretty straightforward—eggs and almond milk (or any liquid). The other three ingredients have potential substitutions that I’ll touch on below. Like my glazed cake rolls and birthday cake protein pancakes, this recipe calls for Pillsbury sugar free yellow cake mix. I buy this ingredient from both Kroger and Walmart in my area. If you’d like to save some time searching, click here to use their find a store tool. I already have the product loaded for you ’cause I love ya. If you’re looking for an alternative option that uses a different sweetener, I’d highly recommend Swerve’s cake mix. Swerve is a sweetener I’ve confessed my love for in many other recipes, and I’ve used the cake mix for my 3-ingredient pumpkin mug cake and 4-ingredient chocolate mug cake recipes. I haven’t tested it with this recipe, but I would recommend swapping it gram for gram with the Pillsbury mix. And if you’d like to skip the cake mix altogether, check out my birthday cake protein cupcakes. They’re made from a combination of coconut flour, all purpose flour, and protein powder. You’ll need a few more ingredients than these simple protein cupcakes, but they’re super tasty! 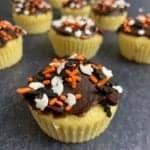 If you’ve tried my birthday cake cupcakes above, you might notice this recipe calls for a different protein powder. 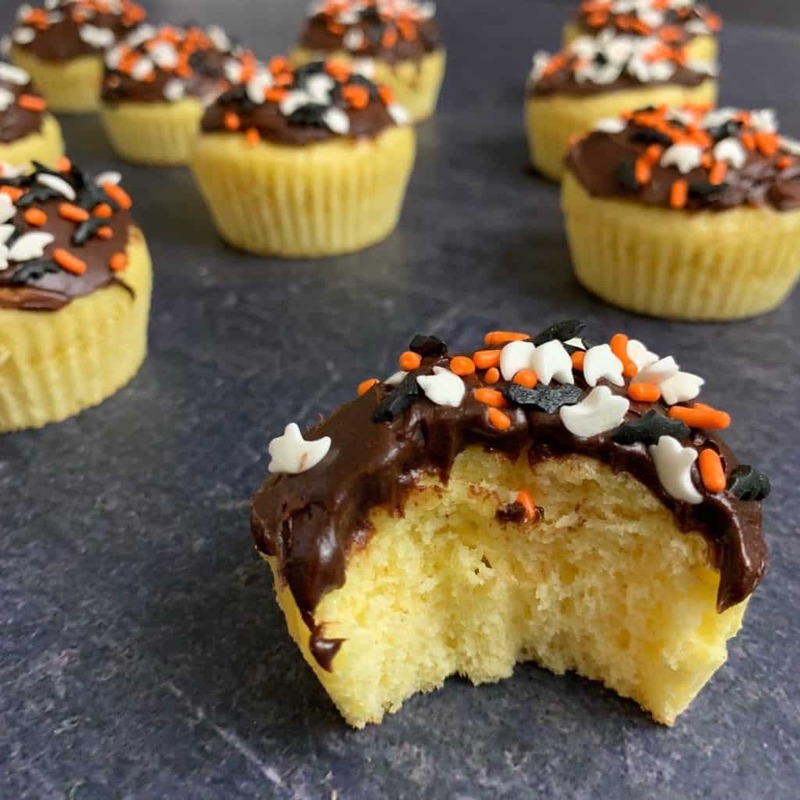 I’ve tried lots, but I think I’ve narrowed my favorites down to the protein in this recipe (PEScience Whey and Casein) and the Dymatize 100% Whey I used in the birthday cake cupcakes and plenty other recipes on my blog. 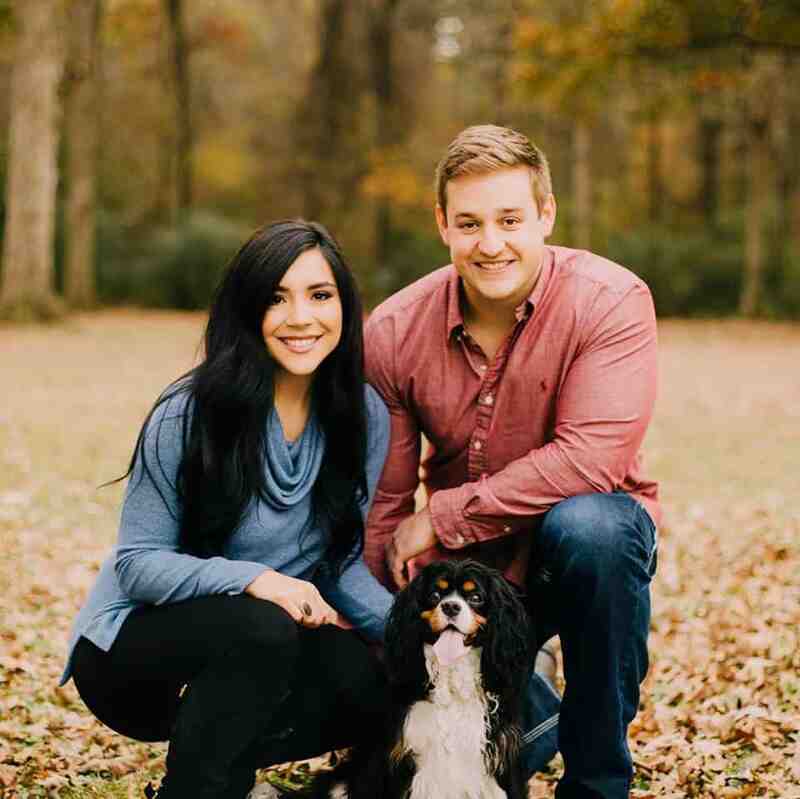 They both cook really well and taste great, and I’d highly recommend checking them out. All that said, I’m not affiliated with either company and can say, use any protein powder you like. I’ll add that leaner types of protein like whey isolate tends to be a little tough or dry in baked goods, and plant-based powders can be a bit granular in texture. The answer for both is usually either scaling back on the protein powder used a tiny bit or adding a bit of extra fat (like light butter or real butter, coconut oil, or a replacement like apple sauce). Update 3/2019: I’ve added notes to the recipe card below for Bowmar Nutrition protein powder. And one last thing on protein powder. If you use a different powder, keep the scoop size in mind. I’ve included the weight of the two scoops of PEScience in this recipe. Your protein powder should have the weight of each scoop on its nutrition label for comparison. 80 grams of protein powder will definitely cook differently than 62 grams of protein powder. I shared the photo above in my Instagram story with all the failed attempts during recipe development. Small changes can take a cupcake from fluffy to rock hard in the blink of an eye. This one is easy. I used a straight out of the container sugar free frosting to keep things super simple. While the macros aren’t amazing, the frosting sure is tasty and super creamy. For comparison, the current recipe’s frosting equates to 400 calories, 0g protein, 68g carbs, and 24g fat. Or 33 calories, 6g carbs, and 2g fat per cupcake. Using another option will take a bit more time in the kitchen but will definitely save some calories. Okay, I think you’re good to go. 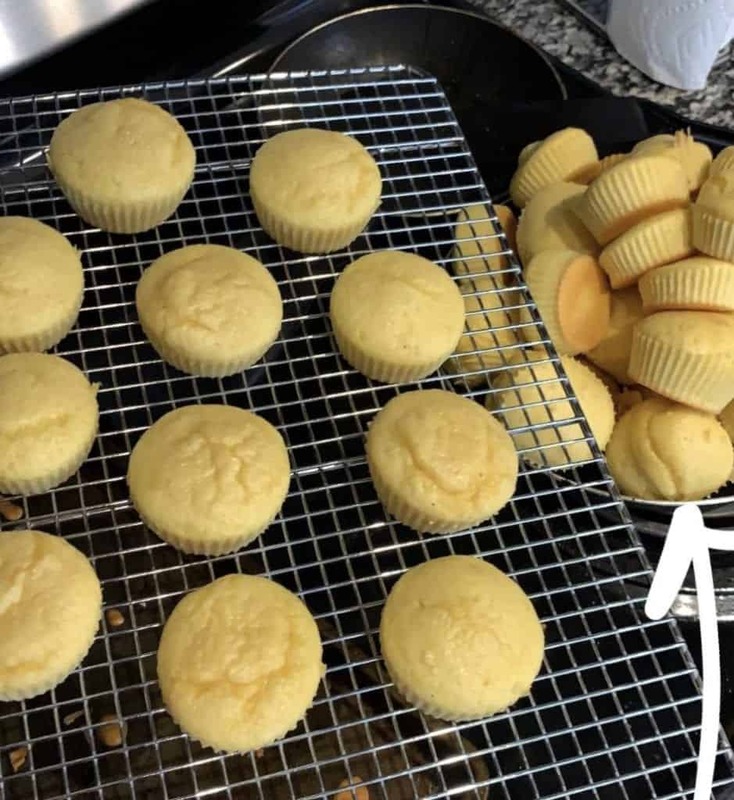 If you make these super simple protein cupcakes, I wanna know about it. Snap a pic and tag me on Instagram. I’ll be sure to share it with everyone. A quick and easy recipe for 99-calorie protein cupcakes with chocolate frosting. Preheat oven to 325F and spray a 12-muffin tin with nonstick cooking spray or prepare 12 silicone baking cups (my preferred method). Mix the dry ingredients in a large bowl before adding the eggs and almond milk. Stir well. 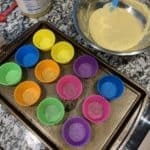 Use a spoon to transfer the cupcake batter to the baking cups or muffin tin, filling each about half way. Start on the lighter side and fill in at the end as needed so you don't run out of batter before you fill all 12. Bake for 12-14 minutes or until a toothpick comes out clean. After the protein cupcakes have cooled slightly, use a knife or icing spatula to spread the frosting on each cupcake. Top with sprinkles if you'd like (not included in nutrition info). *With Bowmar Nutrition Protein Hot Chocolate or Frosted Cookie, use 4 scoops (112g) and keep everything else the same. By the way, the silicone baking cups you see in the instructions are too legit to quit. They’re easily one of the best kitchen purchases I’ve made recently. 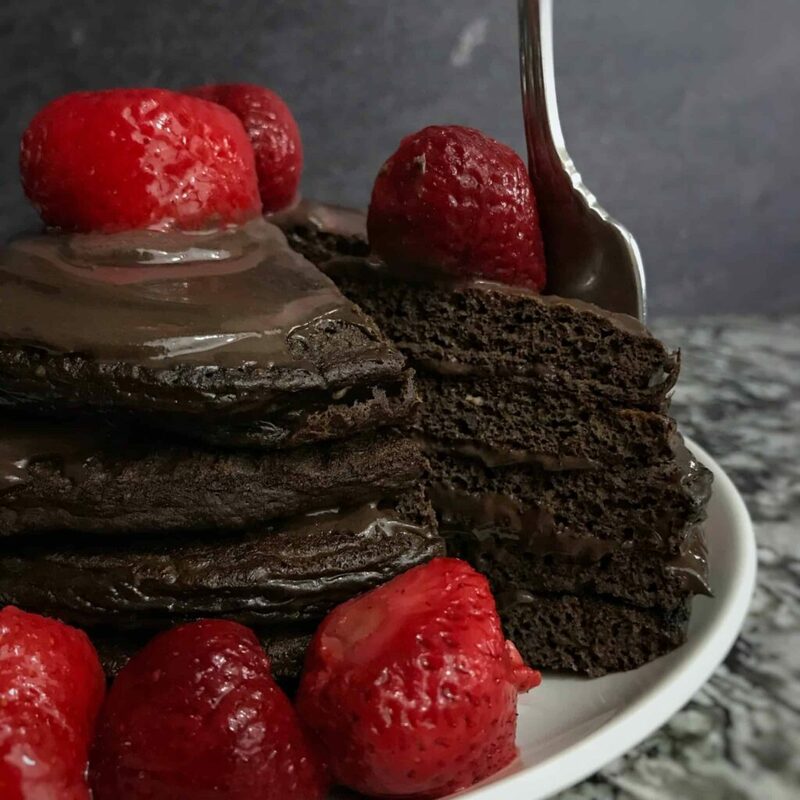 My easy chocolate protein pancakes have over 15 grams of protein each with only 115 calories! One reader went as far as to say they’re the best protein pancakes she’s ever tried. 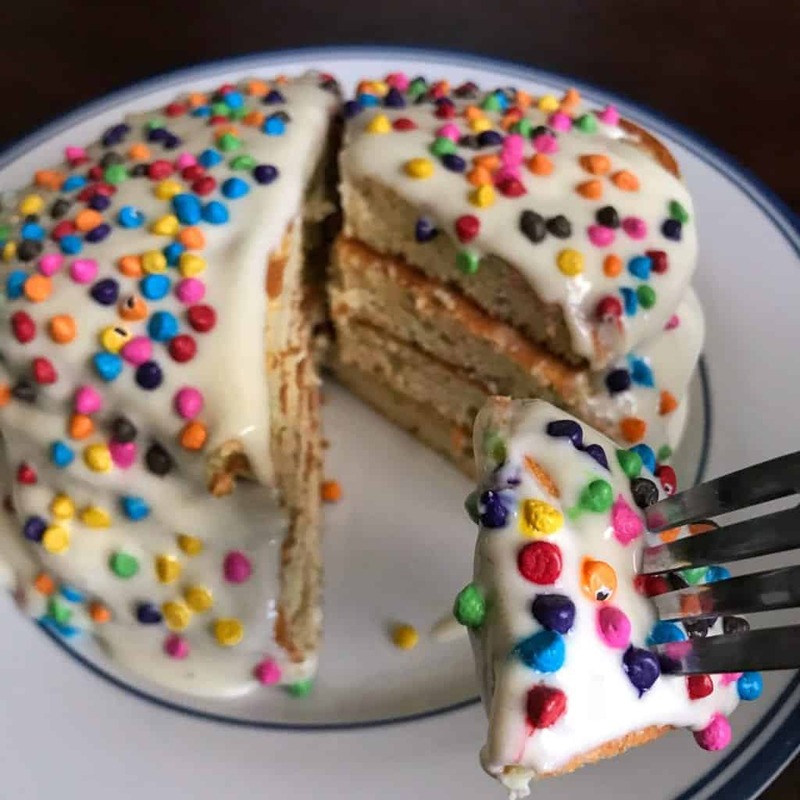 I wasn’t planning on including all protein pancakes here but if you’re looking for something else to make with sugar free cake mix, check out my birthday cake protein pancakes. When I see “5 ingredients” on a recipe I automatically click it. I am so tired from work once I get home yet I want a delicious and easy snack at the same time. Well these are super easy to make when you’re tired but have a sweet tooth. I didn’t have the yellow cake mix at first but added it to my grocery list that weekend and made these the next day. They taste like a nice moist cake. Super yummy and high protein!! I highly recommend. Mine didn’t come out as pretty as Mason’s but they were sure tasty! !